What is your favorite song of the year? 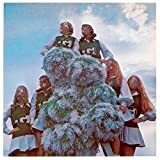 I find Sleigh Bells' "Rill Rill" bouncing through my head regularly, that is probably my personal pick at the moment, so I will give away a CD of the whole album (Sleigh Bells' Treats) this week. Along with the Sleigh Bells' Treats CD, the winner will receive a $100 Threadless gift certificate. To enter the contest, leave a comment in this post with the name of your favorite song of 2010 (or your favorite song this year that wasn't necessarily released in 2010). The winner will be chosen randomly at midnight CT Friday evening (May 28th).